How Can We Tell if Dogs and Cats are In Pain? How can we tell if dogs and cats are in pain? It’s a very good question! In this article, we explain the importance and some of the challenges to providing adequate pain relief for dogs and cats. Do animals feel pain like us? Yes they do. However, for many years this was questioned. The International Association for the Study of Pain (ISAP) defines pain as both a sensory and an emotional experience. In other words, as well as feeling the ‘ouch’ part of pain, there is also an emotional aspect to it. That is why we often feel unhappy if we experience pain. Your back is sore, it hurts to do all the things you do normally and this affects your mood and motivation. This is true for our pets as well and most pet owners have a fair idea when their animal is not right and seems a bit down. Even so, quantifying how a pet’s pain affects them is difficult because they are limited in the ways they can communicate to us. The situation is similar in babies, the elderly and critically ill people – the ability to communicate pain is affected. The IASP definition of pain goes on to say that “the inability to communicate verbally does not mean that an individual isn’t experiencing pain and that they don’t need appropriate pain-relief”. In fact, with our patients we nearly always err on the side of caution and administer a pain killer if we are unsure. The response of the animal will often confirm we made the right decision! Pain is an individual experience. We often hear people say that someone has a high (or low) pain threshold. No two people or animals react in exactly the same way to a given painful stimulus. This is because the pain processing systems in our body are not uniform but adapt based on previous experiences. If we experience a lot of pain over time we seem to get sensitised to it. This is one reason why pain control after surgery for example is so important. It can speed up you feeling better. There is good evidence that babies who undergo painful procedures are more sensitive to pain in adulthood and the same can be said of animals. Have you ever been asked to score your own pain? There has been much work in recent years into pain scoring (or simply ‘putting a number on it’) in dogs and cats. If you undergo an operation in hospital your doctor will ask you whether you experience pain. Sometimes you will be asked to say how bad it is on a scale of 1 to 10. This ‘scoring’ system is extremely valuable for doctors not just to get a better idea of just how bad it seems to you, but also for assessing your response to pain killers or other treatments – they will look to see if your pain score is decreasing. For dogs and cats we cannot simply ask them how painful they are. Well, we can but the responses may not be so reliable! Therefore we need to develop reliable systems to gauge their pain from their behaviour. Such scoring systems have been used widely for dogs and are currently being developed for cats – cat behaviour is a bit more difficult to work out. We use pain scoring after surgery to guide our pain management in the post-operative period. In addition to this, experience with the procedures we commonly perform also gives us the knowledge to know what to expect. Isn’t a little bit of pain a good thing? Our ability to treat pain as vets is increasing steadily as new drugs become available, combined with systems designed to evaluate pain in dogs and cats. Educating pet owners also plays a big part. Whilst some owners may consider it normal for a dog to limp – because that’s what their old dog did – this should no longer necessarily be accepted as ‘just getting old’. There are various pain management options for both dogs and cats long term which allow us as vets and owners to improve the quality of life of our pets. In the past you may have heard people say that a little bit of pain is a good thing. For example, it stops your pet from moving around too much after surgery. This is certainly not true and we have good evidence that too much pain can be detrimental to recovery from surgery. If you consider your pet to be in pain after surgery, then you should ask your vet to prescribe pain killers or at the very least take them in for a check up. 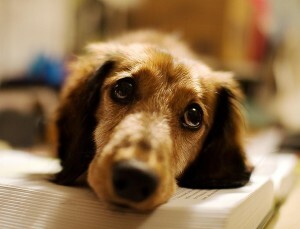 Your role in working out the degree of pain your pet is experiencing is just as important as that of your vet. Another way you can help is completing pain scoring charts when you visit your vet. Now, we don’t use these all the time with owners but they can be very helpful if your pet is having regular visits to assess response to treatment for conditions such as arthritis. These pain scoring systems which we may ask owners to complete at each visit to assess the overall picture and do not solely base assessment of pain on our examination of the pet in the clinic. You know your pet better than anyone and often in a consulting room some dogs and cats will just freeze and not show any pain. We see a different picture to the one you see at home..
Gemma has had a very lucky escape! She went lame whilst chasing a ball over the weekend. 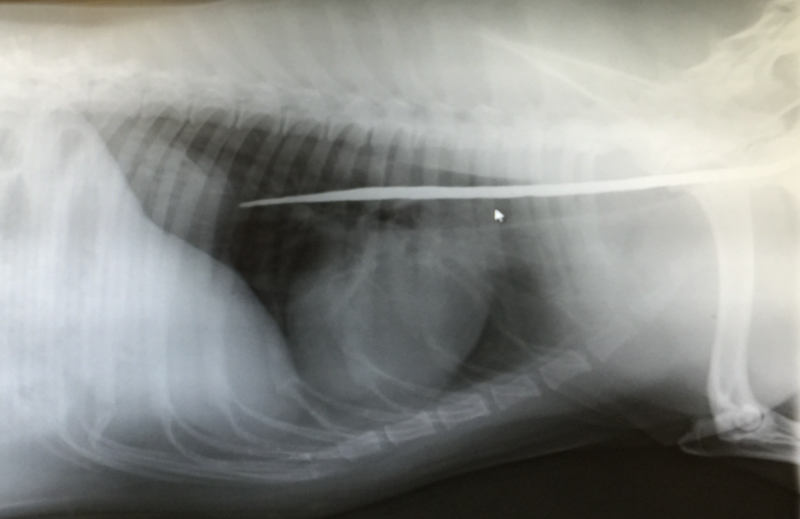 When this failed to resolve her owner brought her to the surgery for examination. 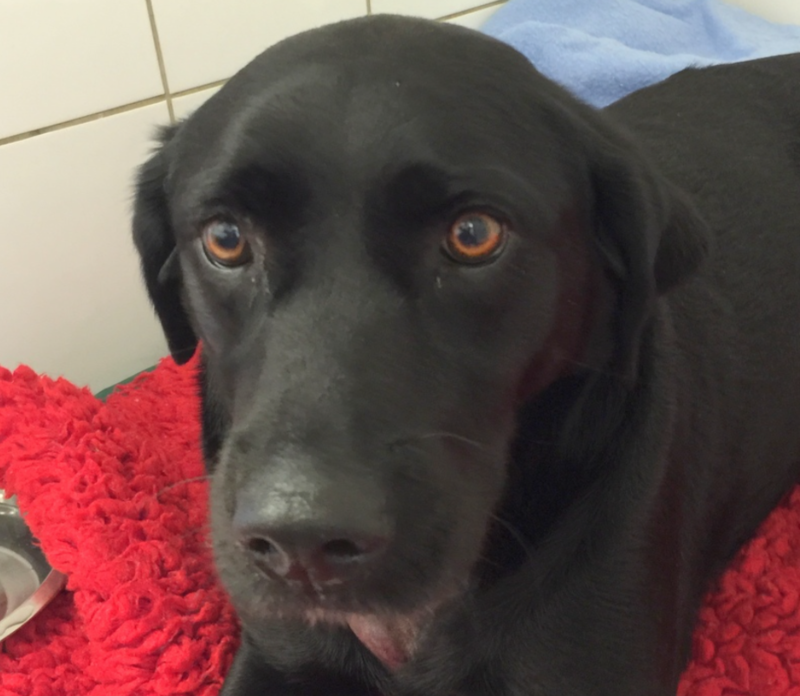 Gemma’s right foreleg was found to be painful and swollen so she was admitted so radiographs could be taken. We were shocked to discover that a 30cm long metal rod had penetrated her body in the region of her right shoulder and got stuck behind her shoulder blade, missing her chest by millimetres (see image on right). It had obviously been protruding from an unseen object and broken off inside Gemma as she ran by, leaving no visible exterior sign of injury, such as laceration or bleeding, to indicate that she had been impaled. 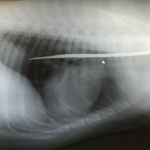 We used the radiographs to define the rod’s location and it was then surgically removed. 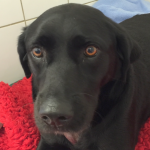 We are delighted to report that Gemma, who has been a fantastic patient, is recovering extremely well!